Dog ear infections can be caused by a primary or secondary infection. They are usually due to a parasitic, allergic or fungal problem. In most cases, ear infections in dogs are reported as secondary to any underlying cause. 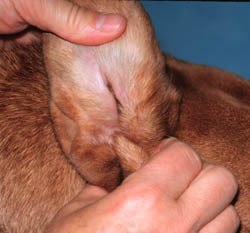 Similarly, canine ear infections can be classified on the basis of how they appear in the ear. Otitis externa, otitis media and interna and that of pinna are some specific infections of the ear identified on basis of their anatomical distribution across the ear. Parasites: Mites, Fleas and ticks are some examples of parasites which can lead to inflammation and secondary bacterial infections in a dog’s ear. Fungus: A dog’s ear is dark and relatively moist environment, where different fungal and algae can grow. Once the level of moisture rises in the inner ear, fungus can grow, eventually causing inflammation and ear infection. Treating such infestations requires specific anti fungal drugs and regular cleaning and drying of the ears. Allergies: Canine atopy (allergic reaction), food allergy, frost bite, flea bite allergy and some environmental factors such as dust etc can cause ear inflammation and hypersensitivity in dogs. The ear is an area where many allergic reactions start. Foreign Agents: Mishandling a dog’s ear can lead to infections as well. Foreign bodies such as some grasses, concreted wax, dense ear cleaners, irritants and some health issues such as hypothyroidism, keratinization and auto immune diseases can act as foreign factors which cause dog ear infections. 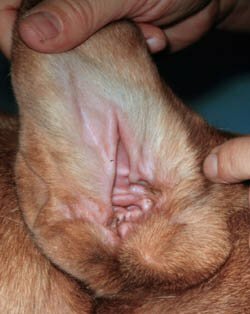 Tumors: Cerumin gland adenoma and inflammatory polyps are two main examples of dog ear tumors, which can cause distributed infection in the internal and middle ear. These are incurable form of dog ear infections and recur after treatment. Symptoms of dog ear infections are similar to those of parasitic and fungal infestations, allergies and any acute problem of the ear. Dog ear scratching, lesions, redness, discomfort and discharge from the ear are some signs related to a canine ear infection. Confirmation of the presence of infection can only be done through a detailed clinical examination by a veterinarian. Clinically, ears are examined for any of inflammation, anatomical deformities and the specific consistency and appearance of any ear discharge. Similarly, the middle and inner ear is usually examined with the help of an otoscope. A clinical examination is usually enough for diagnosing an ear infection, but in some complicated cases confirmation is made through laboratory testing. In the laboratory, an examination of samples from the ear under a microscope, serological testing and examination of exudates (fluids) is made for any specific condition related to an ear infection. A biopsy is done in case a tumor is suspected. Antibiotics are the specific dog ear infections treating method for any bacterial infection. Both topical and general preparations of antibiotics are available for administration. In the case of ear infections (primary or secondary), topical antibiotics are considered to be more effective. Oral or Paraental administration is the only recommended treatment in case of generalized infection. These are administered only with a prescription. Specific treatment for any underlying cause such as for mites, fleas, fungus, allergy or any other problem, specific drugs and preparations are preferred along with antibiotics for dog ear infections treating. Treatment of any underlying cause is essential to prevent recurring secondary ear infections. If you are applying medications to the ear, ask your veterinarian for directions. Ear drops need to enter the ear canal. Never put the tip of any tube more than a few millimeteters down in the canal of the ear, to avoid causing any damage. After treatment, massage the base of the ear. For added ear health and maintenance support, natural remedies such as Ear Dr. and regular ear cleaning with a natural product such as Novalsan is suggested. The middle and inner ear should be cleaned by professional groomers only. Note that some dog ear cleaning products can cause the ear to become dry dur to the chemicals it contains. Ask your veterinarian to recommend the right frequency and approach for your dog.